If you'd like to book a regular rider press "Just my family"
After you select the type of ride you'd like you'll see the calendar where you can pick the date of your ride. Be sure the correct date is highlighted in orange. Note: you must schedule your ride by 7:00pm the day before. After you've set the date, you can scroll the hour and minute to set the time of your ride. Be sure you've selected the correct time of day, AM or PM. Then click the "Next" button. Once the time is set, you'll be prompted to select your riders. You can choose a single rider or multiple. When you’re finished click the blue "Next" button. 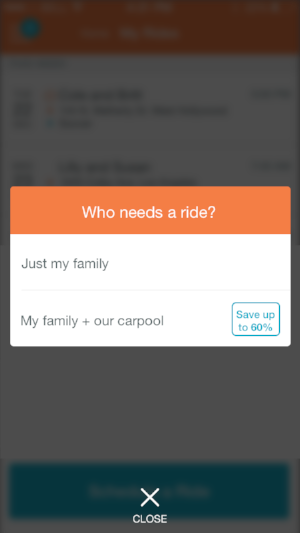 Now you'll enter where your rider should be picked up. You can add a new location by clicking "Add Location." You can add notes to your location by clicking the gray box. 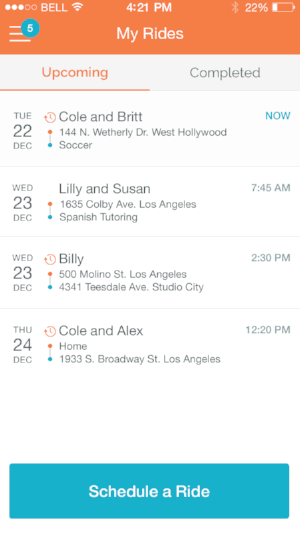 This will help the CareDriver quickly find your rider. Click the "Next" button. Select your drop off location. You can also add notes here to help the CareDriver coordinate your rider's drop off. When finished, click the “Next” button. Before you finish scheduling, you can verify all the information about your ride. You can also make it a repeating ride by clicking that button and selecting when it repeats and for how long. Add your credit card information, a promo code if you have one, and see your fare estimate. When ready, go ahead and then click the blue "Book Ride" button to schedule your ride. You'll receive a text message & email when your ride is matched to a CareDriver.